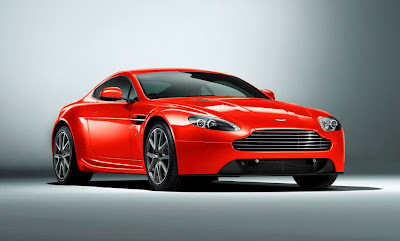 The Aston Martin Vantage range continues to evolve with a comprehensive array of improvements to the Aston Martin V8 Vantage aimed at enhancing the dynamic feel, style and competitive pricing of the marque's entry-level sports car. There are also changes at the top-end of the Vantage range with the new and ultra-exclusive V12 Zagato assuming the role of flagship when it enters production. 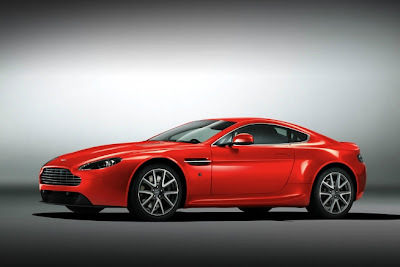 In the most comprehensive programme of enhancements since 2008, the revised 4.7-litre 420bhp (426PS/313kW) entry-level Aston Martin V8 Vantage features a raft of improvements first seen in the critically acclaimed Vantage S. The standard six-speed manual transmission remains, but the optional six-speed Sportshift™ automated manual transmission has now been replaced with the seven-speed Sportshift™ II. With an additional gear, closer ratios, lower final drive and a quicker, refined shift quality, this new gearbox - designed and manufactured specifically for Aston Martin - provides faster and more precise shifts, optimises acceleration and delivers a sporting driving experience. Further dynamic enhancements centre on the Aston Martin V8 Vantage's chassis, which features developments from the Vantage S. Quicker steering, bigger brakes and wider tyres have all been fitted to further enhance the Aston Martin V8 Vantage's class-leading poise and make it even more responsive and exciting to drive. A new steering column installation, re-valved power-steering pump and a quicker ratio of 15:1 compared to 17:1 on the previous model ensure the new V8 Vantage steers with even greater precision, handles with more agility and provides more feedback for a completely engaging drive. Stopping power and pedal feel have been significantly increased thanks to new 380mm two-piece ventilated cast-iron front discs and six piston callipers. This new braking system also includes Hill Start Assist (HSA) for more precise control on steep inclines. The Aston Martin V8 Vantage also comes with tyres that are 10mm wider than the outgoing model. Not only does this increased contact area improve the V8 Vantage's already prodigious levels of road-holding, but it allows the more responsive steering and stronger brakes to be fully exploited. To reflect its enhanced performance the Aston Martin V8 Vantage has received a number of styling changes inspired by the Vantage S and N400 limited edition. At the front a lower bumper - complete with aerodynamic splitter - houses a larger air intake that feeds the engine and front brakes. At the rear a diffuser creates added drama and function, while sculpted race-derived side sills complete the V8 Vantage's more muscular look. 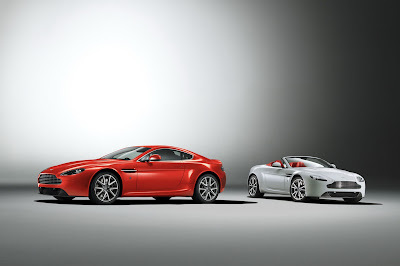 These technical and styling changes have been applied to both the Aston Martin V8 Vantage Coupe and Roadster models, with prices starting from £84,995 / €108,500 (Germany). The £99,995 / €128,500 (Germany) Vantage S remains the most generously equipped, highest performing and most driver-focussed V8-engined model in the range. Developing 430bhp (436PS/321kW) at 7300rpm and 490Nm (361lb ft) of torque at 5000rpm the Vantage S's more potent state of engine tune perfectly complements the Sportshift™ II close-ratio seven speed automated manual transmission, which is fitted as standard. A sports exhaust system unique to the 'S' further emphasises its sporting credentials, delivering a rousing soundtrack, totally in keeping with the intensity of the driving experience. Carbon fibre detailing of the Vantage S's motorsport-derived aerodynamic package makes a discreet and highly appealing visual distinction from the V8 Vantage, while inside the 'S' variant features a sumptuously trimmed interior that demonstrates Aston Martin's unique ability to combine the craftsmanship of traditional hand-stitched leather upholstery with striking modern design. The company's fully integrated satellite navigation system developed in conjunction with Garmin is now fitted as standard along with Bluetooth and cruise control. Production of the sensational V12 Vantage continues unchanged; this acclaimed model delivering its unrivalled blend of extreme performance, exclusivity and practicality in one unique package. Powered by a 6.0-litre V12 engine producing 510 bhp (380 kW / 517 PS), and 570 Nm (420 lb ft) of torque, this remarkable evolution of the Vantage has a top speed of 190 mph (305 km/h) and 0-62 mph (0-100 km/h) time of 4.2 seconds while its uniquely thrilling character distinguishes it from the rest of the range. In late 2012 the Vantage range will be joined by the exotic V12 Zagato, created in 2011 to celebrate the 50th anniversary of the iconic DB4GT Zagato. A prototype V12 Zagato caused a sensation by winning the prestigious Villa D'Este concours and competing in the Nürburgring 24-hour race. Now, less than 12-months after its dramatic debut, the V12 Zagato - employing a unique blend of bespoke Italian design, hand-built craftsmanship and advanced technology - is poised to enter strictly limited production, with first deliveries to commence later this year. Racing is in Aston Martin's DNA and the Vantage is at the forefront of Aston Martin's motorsport activity. The Vantage first went racing in 2006, when Aston Martin's CEO Dr Ulrich Bez and members of the company's engineering department took a near-standard Aston Martin V8 Vantage to the gruelling Nürburgring 24 hour race. Since then GT4 versions of the V8 Vantage have become a force to be reckoned with, spawning one-make race series and winning their class in Dubai, Nürburgring, Silverstone and Spa 24-hour races. For 2012 Aston Martin Racing is stepping up a gear with the new V12 Vantage focused race car. Currently undergoing an extensive test programme this spectacular new racing car will be in action throughout the 2012 season. Combining iconic styling, thrilling performance, true craftsmanship and exclusivity the revitalised Vantage range boasts unprecedented breadth and appeal. The revised Aston Martin V8 Vantage together with the rest of the range is available to order now from Aston Martin's global dealer network.